Welp, my low-buy’s not going that great! I spotted a slew of colors from China Glaze’s new fall collection, The Great Outdoors, at Winners and decided to pick up…several. 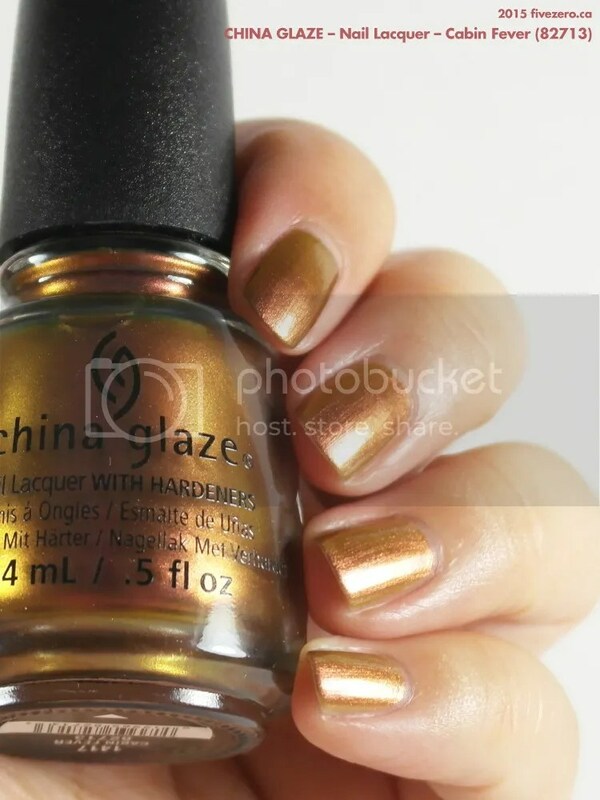 This is the first China Glaze collection I’ve been wowed by for some time now! I got Cabin Fever, Check Out the Silver Fox, Free Bear Hugs, Pondering, Sleeping Under the Stars, and Wood You Wanna?—I’ll review one today and the remaining five next week. Cabin Fever (82713) is one of a few iridescent polishes in this collection. 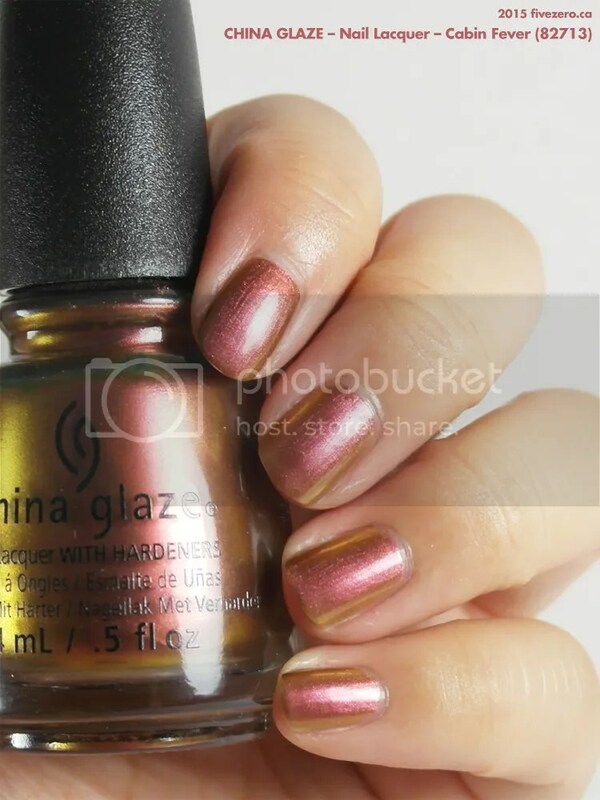 It’s a cranberry pink-to-caramel bronze duochrome with a metallic finish. The pink has a touch of plum; the bronze has a touch of antiqued gold. It’s just about as perfect a fall nail color as you could ask for! Think cranberry sauce and turkey stuffing. (Or maybe I just have food on my mind.) I literally could not stop staring at my nails with this on, and trying to catch it at different angles. Application was excellent, smooth and streak-free. Two coats was perfect. Hurry up and grab this one, guys! Isn’t that a fantastic poster? 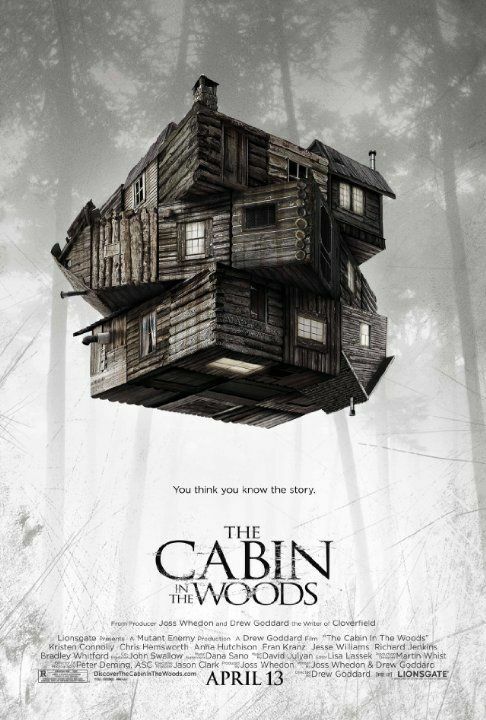 The Cabin in the Woods is a comedy/horror movie and the brainchild of Drew Goddard and Joss Whedon. It’s satirical, hilarious, and strange, and you’ll have fun trying to figure out exactly what the hell is going on (there’s a twist at the end, plus a great cameo). And, even if comedies/horror films aren’t your thing, it also stars Chris Hemsworth. Nice duochromes can be hard to find! Gorgeous duochrome. A bit too frosty for my taste, but still a pretty polish. I really like the duo chrome shade and in particularly, I fell in love with the name first and it also reminds me of travelling in airlines. Haha, I didn’t think of that – airline cabins! 😀 I like it. I’m a fan of this new collection, but that low-buy though…… hmph. Thanks! It is verrrrry duochrome-y, so not hard to capture. I just bought the set of minis at Ulta today! Gonna switch it up! I’ll start posting soon! I can’t wait to start swatching!!! Whoa you captured the duochrome really well! And ugh that movie. I went into The Cabin in the Woods know a little bit about it and wow, that movie is a completely new genre it itself, lol! I can’t even explain it to anyone. I was surprisingly entertained even though it was quite gory… the merman, lol. I have Awakening, and yes, it’s so pretty! Wild & Willing actually looks surprisingly close, and yes, more glittery than frosty. Both super nice – thanks for the heads up on the Color Club. Tsk! Tsk! And nail polishes failed your low buy.😂Believe me when I was on a low buy, I refrain from going to supermarkets or anything of some sort for I know I’m weak to resists. This color are like the autumn leaves, I know the feeling of admiring in diffrent angle and catching the right color. Haha, yes, it’s terrible! I just shouldn’t go, but the last couple times, I was actually looking for non-cosmetic items, and I just can’t leave without checking out the nail polish, right? 😀 Iridescents are great any old time, but they are definitely more reminiscent of fall, to me!